I am sending my clad and silver Baseball Hall of Fame proofs to PCGS for grading and encapsulation this morning. This was not an easy decision, especially for the lower value clad versions. First, there is the issue of cost. PCGS has a quarterly special for grading these specific coins of $39 each. That's twice the original cost of the clads from the Mint and almost as much as the silver, so it adds a significant price burden to each coin. Second, non-numismatic buyers might prefer original Mint packaging. The possible wide appeal of this particular coin might create an unusual situation where it could be harder to sell the certified versions! I don't expect that to be true, but anything is possible. These issues are of particular concern to "flippers" - those who bought hoping to turn around a quick sale and profit. Many of them seem to believe that the opportunity for profit will be short lived - they expect values to crash after initial euphoria. They do have some history on their side. Quite a few modern commemorative issues have lost value. There simply have been too many issued, not necessarily in terms of mintage, but in variety of design. While many coin collectors might be able to accurately name each of the older 1892 to 1954 commemorative coins, I suspect that naming those issued since 1982 would be far more difficult. Individual examples might have done well by themselves, as a group they become a bit overwhelming. I think the Baseball coins are different. The radical curved design sets these apart and baseball is an incredibly popular sport, so that creates wider appeal. 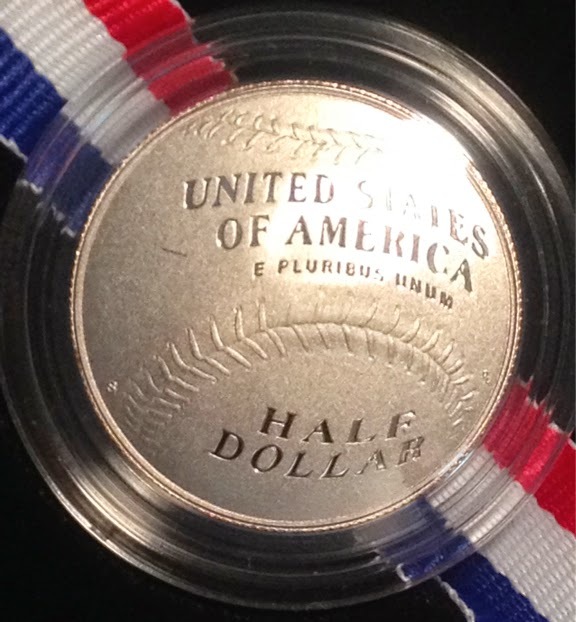 There are also already baseball card collectors; collecting this coin could be an easy decision for them. My guess is that values will stay strong and may even increase. So, I won't be a flipper. I'll be putting these away for a long time. It's quite possible that the next people to see these (after they return from PCGS) will be my children after my wife and I are gone. If so, I hope they are pleasantly surprised by the value at that time.